How Many Muslims in the United States? I reviewed this contentious topic shortly after 9/11, using evidence from two reliable surveys, at "How Many U.S. Muslims?" At that time, responsible publications were tossing around figures like 7 million. Fortunately, those exaggerations are no longer widely used. No, the population did not actually decrease; to understand this reduction in the estimate, see my October 2001 analysis, "How Many U.S. Muslims?" In it, I report on two recent surveys, by the American Religious Identification Survey 2001 and Tom Smith of the University of Chicago, which found the number of U.S. Muslims to be under two million. Aug. 15, 2003 update: Using information from 1990 and 2000 national censuses, John R. Logan and and Glenn Deane find under 2,900,000 Muslims living in the United States. 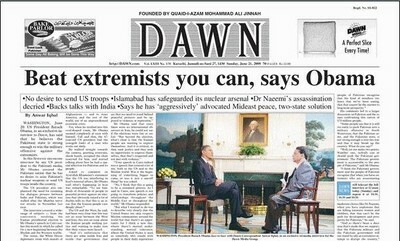 June 10, 2004 update: Islamist organizations, however, continue to make fantasy claims. Today the Islamic Society of North America issued a press release indicating that it represents "10 million American Muslims." Of note too is the statement by a journalist in the Seattle Post-Intelligencer (in February 2001), presumably influenced by one of the Islamist sources of the article, that Islam is "the second-most popular religion after Catholicism" in the United States. Oct. 15, 2004 update: Abdel Rachid Mohammad, the first Islamic chaplain in the U.S. armed forces, tells Agence France-Presse, that there are eight to ten million Muslims in the United States. Given his official capacity, this inflated number is especially unfortunate. June 14, 2005 update: In an undated commentary on the homepage of his organization, The Mosque Cares, W. Deen Mohammed writes that "Partly through conversion but mainly through immigration, the number of Muslims has now risen to three or four million." What a refreshing change from the boosterism of the Islamists. (Also of note is that he uses the spelling G-d, as in "there is but One G-d and one human family." June 21, 2006 update: "There are almost 8 million Muslims in America," asserts Daisy Khan, executive director of American Society for Muslim Advancement, in a puff-piece produced by the U.S. Department of State. 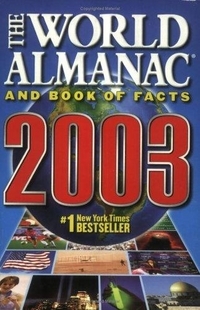 Oct. 31, 2006 update: "Baron Bodissey" of Gates of Vienna has the interesting idea in "The Numbers Game" to extrapolate from U.S. experience and slash boosterish estimates for Muslim populations around the world by 1/3. Instead of 21 million Muslims in western Europe, for example, he counts 13.5. The Pew study projects approximately 1.5 million adult Muslim Americans, 18 years of age and older. The total Muslim American population is estimated at 2.35 million, based on data from this survey and available Census Bureau data on immigrants' nativity and nationality. It is important to note that both of these estimates are approximations. Feb. 22, 2008 update: Pew offers another estimate in its "U.S. Religious Landscape Survey," where it finds the U.S.-based Muslim population to be 0.6 percent of the total. Given that latter is about 300 million, the Muslim population would be about 1.8 million. Apr. 16, 2008 update: Newsweek's Lorraine Ali writes of "the nation's 8 million Muslims." Mar. 9, 2009 update: The American Religious Identification Survey, based at Trinity College, conducted by Barry A. Kosmin and Ariela Keysar, finds that the number of Muslims in the United States has increased from 527,000 in 1990 to 1,104,000 in 2001 to 1.349,000 in 2008. June 4, 2009 update: Defying all we know about this topic, Barack Obama today announced the figure of "seven million American Muslims" in the course of his major speech on Islam delivered in Cairo. I comment on his reasons for doing this at "Assessing Obama's Cairo Speech." Simultaneously, the Department of Justice put out a backrounder, "Outreach and Enforcement Efforts to Protect American Muslims," that retreats slightly from Obama's preposterous number, instead referring to "the nearly seven million American Muslims living in the United States." June 21, 2009 update: Obama retreated substantially, though not enough, from his seven million figure, saying in an interview with the Pakistan newspaper Dawn, "we have 5 million Muslims, which would make us larger than many other countries that consider themselves Muslim countries." Sep. 15, 2009 update: Obama may have retreated but U.S. Secretary of State Hillary Clinton used the old figure at the Department of State iftar this evening, referring to "the nearly 7 million Muslims in our country." Jan. 27, 2011 update: A study of Muslim populations worldwide by the Pew Research Center's Forum on Religion & Public Life, "The Future of the Global Muslim Population: Projections for 2010-2030," finds the number of Muslims in 2010 to be 2.6 million and predicts 6.2 million in 2030. May 2, 2012 update: The decennial census conducted by the Association of Statisticians of American Religious Bodies finds that Muslims in the United States have increased to 2.6 million in 2010 from approximately 1 million in 2000. 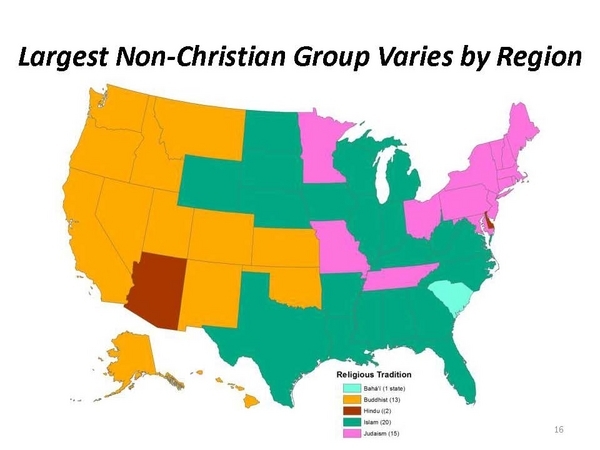 The study also includes a map of predominant non-Christian religions, finding Muslims largest in number in 20 states, Jews in 15, Buddhists in 13, Hindus in 2, and Baha'is in 1. Comment: I have my doubts about these figures but offer them anyway because they are so interesting and unexpected. Apr. 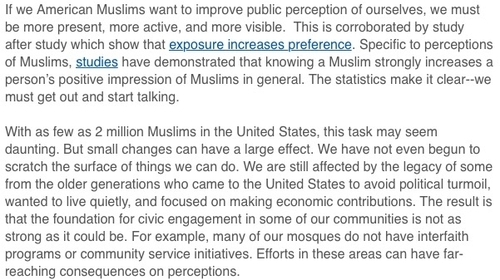 17, 2015 update: In an unprecedented concession to reality, an e-mail from the Muslim Public Affairs Council titled "Fear of the Unknown: How to Improve Perceptions of Muslims" refers, in the midst of a discussion about the challenges facing Muslims to improve their reputation, to "as few as 2 million Muslims in the United States." Comment: Is this a one-time aberration by MPAC or the start of a new tact? An extract from the e-mailed MPAC newsletter. Screen grab from the DinarStandard summary. 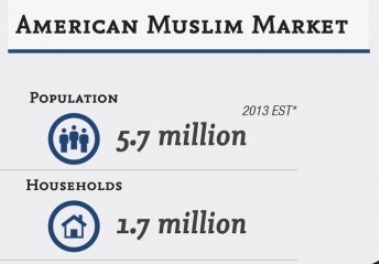 June 25, 2015 update: In a mish-mash of inaccuracy, something called DinarStandard in partnership with the American Muslim Consumer Consortium put out a study in 2014 that claims the American Muslim population in 2013 was 5.7 million, made up of 1.7 million households. Then the New York Times refers to the study and pumps that population number to 9 million. Comment: The MPAC figure does look like an aberration. Jan. 6, 2016 update: The Pew Research Center's Besheer Mohamed has published "A new estimate of the U.S. Muslim population" that estimates there are 3.3 million Muslims now living in the United States, making up about 1 percent of the total U.S. population of about 322 million people. 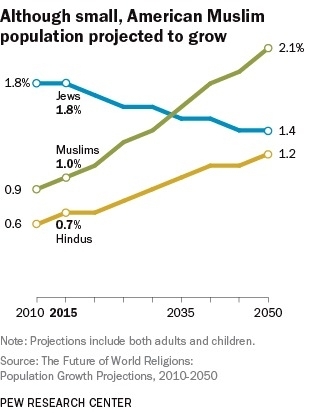 It estimates that the Muslims in 2050 will make up 8.1 million people or 2.1 percent of the population. It finds that just over half of the growth of the American Muslim population from 2010 to 2015 was due to immigration, the rest from natural increase. Most interestingly, it sees that "About as many Americans become Muslim as leave Islam." Dec. 23, 2016 update: MPAC referred in April 2015 to "as few as 2 million Muslims in the United States" and now CAIR's Ibrahim Hooper is paraphrased in the New York Times saying that "the real number [of American Muslims] is between 1 or 2 percent," meaning between 3.2 and 6.4 million. Comment: That's still a lot, but much less than CAIR's usual fabulous numbers of earlier years.